Filled with only the finest from Lancaster County! At the Village Farm Market we specialize in creating delicious food for your ease in planning those special occasions. We offer attractively designed and declious trays that are perfect for: lunch for your construction crew, team meetings, school functions, staff lunch, birthday celebrations, customer appreciation days/open house, weddings/receptions, church gatherings, tea parties, etc. Call ahead to order your trays! This tray of assorted fruits includes pineapples, grapes, oranges, melons, cantaloupes, strawberries, and apples. (Locally grown in their season.) Comes with our homemade fruit dip! 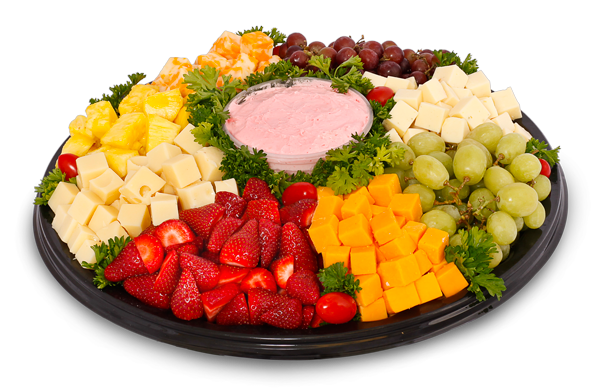 This tray includes pineapples, grapes, and strawberries along with your choice of cheese. Comes with our homemade fruit dip! This tray comes with an array of garden vegetables – broccoli, cauliflower, carrots, celery, pepper and cucumbers. Comes with Ranch dip! This delicious tray features low-carb wraps filled with a variety of lunch meats or salads. There is something for everyone on this delicious sub tray. Ask for your choice of assorted subs. These mini sandwiches are perfect for appetizers, tea parties or a light snack. 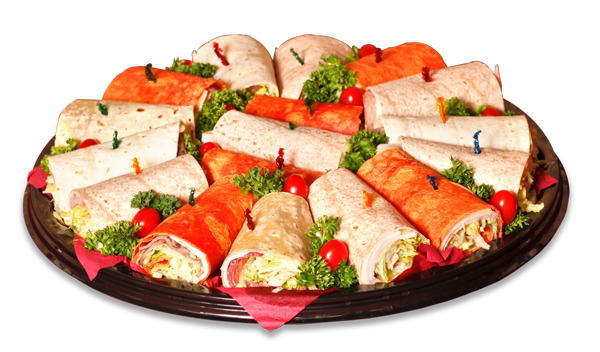 They are served with an assortment of salads or your choice of deli meats. Your guests will enjoy them! These delicious, fresh baked sticky buns are ideal for your coworkers & friends! Order for early morning pickup. This platter is filled with roast beef, smoked ham, turkey breast; Swiss, American, Farmers, and Hickory Smoked cheeses; topped with black olives and pickles. Available as a cubed tray with dipping mustard. Order our freshly baked homemade cookies. Choose from Soft Chocolate Chip, Snickerdoodle Cookies, Soft Sugar Cookies, and more! Try our freshly baked fruit breads – Blueberry, Cranberry Orange Nut, Lemon Poppyseed, Apple, Banana Nut & More.